Elder Orson F. Whitney, City. I should be pleased to have you and Joseph F. Jr. act as a committee to hear the reading of a work on the Doctrine and Covenants by Hyrum M. You will please render your best assistance to see that no error in doctrine or inaccuracy in history, should there be any, escapes notice. Hyrum will confer with you as to the time that will be convenient for the reading. The review committee went right to work: “Spent the forenoon in my office, reading with Hyrum M. and Joseph F. Smith Jr. part of the ms [manuscript] of Hyrum’s work referred to in his father’s letter. We have had several previous sessions thereon.” Whitney’s diary indicates the reading/correcting committee meetings continued into July of 1917. Issued from mission headquarters in Liverpool, England, in 1919, it contained 1100 pages and was the first D&C commentary ever written. The original royalty agreement was that for the first 15,000 copies sold, Elder Smith, Janne Sjodahl, and the Church would each get a third of the profits; however, the financial aspects were complicated when before the book was even published Hyrum M. Smith died (Jan. 23, 1918); then a short time later his widow and heir died (Sept. 24, 1918), and then President Joseph F. Smith died (Nov. 19, 1918), leaving royalty and ownership arrangements in a state of confusion. Only after Sjodahl returned from England to Salt Lake City were things sorted out and the ownership of the book given to Sjodahl who by that time had become editor of the Improvement Era. As to the years here mentioned, “The information in the Millennial Star and in Sjodahl’s letters during this period, also the fact that Sjodahl did not arrive in England until September 22, 1914, all point to the fact that the suggestion that they worked on the book jointly between the years 1913-1916 must be incorrect” (Brent Lundgren, Janne Mattson Sjodahl…, BYU Masters’ Thesis, 1971, 85). 1915 to 1917 are probably more accurate. The 1951 revised edition Publication Committee editors indicate that at least some of what they updated in the book included the following: “Since the time of the first publication many world-wide events of the greatest importance have occurred many of which have a bearing on the fulfillment of the prophecies found in the Doctrine and Covenants; these have been noted.” However, again, “It should also be noted that the most recent edition  of the book is still very much the same as the original 1919 edition. The changes and revisions have been very minor” (Lundgren, 85). One might wonder about this conclusion since the first edition has about 200 more pages than the revised, although it is also printed on smaller pages. A few of the changes between editions that I have noticed include the following: Sjodahl’s prefatory comments following Hyrum M. Smith’s preface were omitted from the revised edition (it is not called a “second” edition, but a “revised” edition)—probably as part of an effort to emphasize the Church’s current ownership and approval. Sjodahl’s name was also added as coauthor. The inconvenient and clumsy roman numerals were changed to modern numbering. Worth noting theologically, there is an alteration of the doctrine taught on page 1021 of the first edition and on 829 of the revised edition, in regards to correctly interpreting D&C 132:26, something Joseph Fielding Smith felt to be a very important correction; evidently he missed it during the first 1917 readings/corrections (see the quotations from the book below). Also worth noting, and remaining the same in both editions— in Isaiah 9:6 among the name-titles given for Jehovah/Jesus Christ is that of “Wonderful”, and “Counsellor.” In the Commentary, that rendering is given as “Wonderful Counselor” as a two-word name-title without the coma (see the Commentary for D&C 88:106-7, either edition). 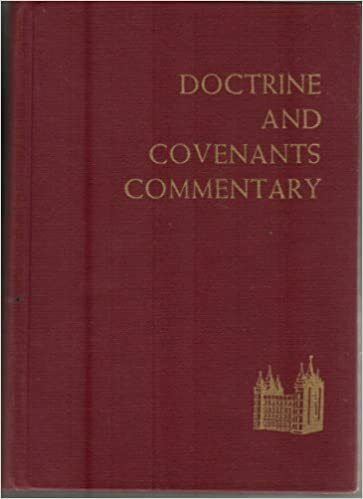 The first edition of Doctrine and Covenants Commentary has become collectible because of its history, scarcity, and approved status; the revised edition has been reprinted a number of times but has not seemed to catch on as a commonly used or cited reference work among church members. The fact that you are married in the temple does not guarantee exaltation. The fact that you are married in the temple opens the door to exaltation, on condition of subsequent conformity. That is vital [to understand]. I don’t know how common this [misunderstanding] is in the Church; it doesn’t seem to be quite as common as it was a few years ago. A few years back there were clusters of people all over who were preaching and believing and supposing and thinking, that Oh well, we have been married in the temple now, and it would be a good idea if we did right, we know that; but on the other had we have been married in the temple, and so even though we commit all manner of sin, eventually we are going to get the blessing anyway. That kind of a doctrine is a deterrent to personal righteousness. It really is a doctrine of the devil because it is an enticement, in a manner of speaking, to live contrary to the principles of personal righteousness that the gospel requires. A similar work to Doctrine and Covenants Commentary is Joseph Fielding Smith’s Church History and Modern Revelation (4 vols. paperback; 2 vols. hardback) which was used as an official study manual for the Church in the mid-1950s. This Doctrine and Covenants study guide was published by the Quorum of the Twelve Apostles through Deseret Book and copyrighted by President David O. McKay, making it another of the relatively few official authored book publications of the Church. The two-volume hardbound edition is the rarest and most sought after by collectors. Because the dates (around 1950) wherein Joseph Fielding Smith served on the second D&C Commentary reading committee was near the time (1953) that his Church History and Modern Revelation work was issued, one wonders if there was some correlation or overlap with the work involved. As an item relating to the above quotations, one of the more interesting statements that I have found in Church History and Modern Revelation is the following: “It is a far more serious matter for a husband and wife to seek a separation [divorce] than many seem to think. The words of the Lord as recorded in Matthew 19:3-9, should be carefully considered. I am convinced that the Lord will force some couples who separate, without justification after they have been sealed in the House of the Lord, back again to each other, or else they will lose their reward” (2:359). Both of these lesser-known church-approved publications on the Doctrine and Covenants were largely written or influenced and approved by apostle sons of President Joseph F. Smith. Hyrum M. Smith is far less well-known, almost unknown, in the Church today, than was his younger brother Joseph Fielding Smith, who later became its President.